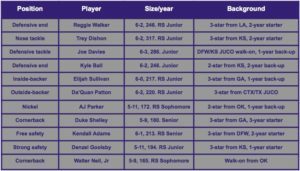 Can Kansas State play smarter and faster on D in 2018? This should be one of the big storylines about K-State in the 2018 season. As I’ve detailed many times before, the Kansas State defense is primarily geared around playing sound coverages and making opponents beat them down the field. They can mix things up in a few different ways to try and encourage teams to execute in a particular area of the field and they have some blitzes they can mix in but for the most part they’ve just been about holding up and making sure that they make you beat them. The early word out of spring camp was that new DC Blake Seiler was mixing things up some by disguising coverages and showing different looks to the offense. Under Tom Hayes they didn’t do that very much out of concern that they’d get themselves out of position and end up gifting free yards to the offense. The Wildcats in the second Snyder era have generally had the mindset that if you were going to beat them that was fine but they weren’t going to beat themselves. But sometimes that meant they would be attacked by opponents that would get to the line, run a fake count to reveal the Wildcat D, then look to the sideline and check into a different call with the assurance that the Wildcats wouldn’t also check into something different. Here’s an example against Texas. It’s third and three and the Longhorns get to the line with time to spare and wait for the Wildcats to “declare” their call. With a trips set like this you’re pretty much getting either the standard “stress” quarters call or that SS is spinning down over the #3 receiver so that the outside-backer (#46 Jayd Kirby) can re-enter the box. Well the SS (#20 Denzel Goolsby) spins down and Kirby rejoins the box so Texas now knows what’s up and can change up their call to give them the best chance to execute here. While the Wildcats’ cover 3 call allows them to get their LBs in the box it also handles the RB with man coverage by whichever LB he releases to. Texas knows this, they release RB Chris Warren out wide and Kirby chases him, leaving K-State short manned against the QB draw. The Wildcats are probably going to be small at nickel since Walter Neil, Jr and A.J. Parker are the main contenders to play there alongside Duke Shelley. Additionally, the safety tandem of Denzel Goolsby and Kendall Adams makes for a good run support unit moreso than a coverage crew. That’s always been a big call for K-State and they’re at their most deadly when they have a veteran playmaker like Ty Zimmerman or Dante Barnett hawking down from that SS perch. They should have that with Goolsby back after a solid 2017. One key to that approach is a nickel who can play with a robbing safety inside of him rather than a safety that is waiting to pick up the receiver on anything past eight yards. 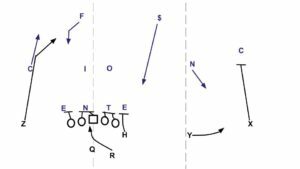 After that, if you can lock up routes and receivers with your corners and nickel then you can have the safeties sitting on the deep inside routes flat-footed and then rallying to stop the run. The more aware your safeties becomes of opposing tendencies and the faster they get at reading and firing downhill, the more this becomes a suffocating, 9-man front. This has been the name of the game at K-State for a while and it’s a nice marriage of “bend don’t break” with “but let’s be able to get numbers to stop the run.” They also mix in calls where the nickel forces the edge but you figure that’ll happen less if it’s 170 pound Neil Jr or Parker. They’ll also play some cover 3 which also tends to fare better when the nickel can cover and uses the safety more in run support. Then of course there’s the outside-backer, or the “money-backer” in Saban parlance, who is whichever of the two inside LBs in nickel that shades towards the tougher coverage assignment. It would seem that Patton is going to fill that role since he was lightning quick at his JUCO and was redshirted in hopes that he could play there and be an answer to this perpetual problem the Wildcats have had of how to find LBs fast enough to stay on the field in their four-down package. B) at least one LB that’s almost more like a box safety that can cover in addition to filling inside gaps. And both of those have been issues in the second Snyder era when top athletes recruited from national locales have been harder to come by than hard working locals for whom playing at K-State means something whether Snyder sticks around or not. The Wildcats seem well positioned to be solid at CB in the coming year and they’re almost always good at safety where the baseline of athleticism is lower and things come down more to development and fundamentals. They also tend to find sturdy DL and good LBs, but the big key is whether they have CBs you’re afraid to throw at, a DE or two that you struggle to block on dropback passes, and that dime LB hybrid. At 6-0, 217 he’s exactly the sort of quick moving, low to the ground guy that can thrive in the modern spread era. If both he and Patton can play outside-backer than you just align them based on optimization and you don’t have to stay up at night wondering what will happen to your defense if an opponent is clever with motion or if someone gets hurt since the Wildcats are probably pretty confident that Sam Sizelove or another backer can play the inside position pretty well if someone gets hurt. The upside of having two speedy LBs on the field is pretty big. It’s easier to disguise your intentions but more importantly it’s easier to run things down and limit the damage from explosive plays. The Wildcats only ranked 54th in IsoPPP+ last year meaning that when they got beat, it was often pretty bad. Well the 2018 defense figures to be smaller but also faster at CB, Ni, and both LB spots. Since the 2012 season the Wildcats have generally been solid up the middle at DT, LB, and S but then never great at DE, CB/Ni, and outside-backer all at the same time. They usually have a hole somewhere, last year it was DE (in terms of the pass-rush at least). It doesn’t work to just sit back and dare people to beat you when you’re imminently beatable. In year one for Blake Seiler it looks like he’s going to try and shore things up on the margins by being a little smarter and a little faster. If that works out it could be the difference between a B12 title and another year as a middle-rung bowl team.